Kim John Un makes good on at least one of his promises. 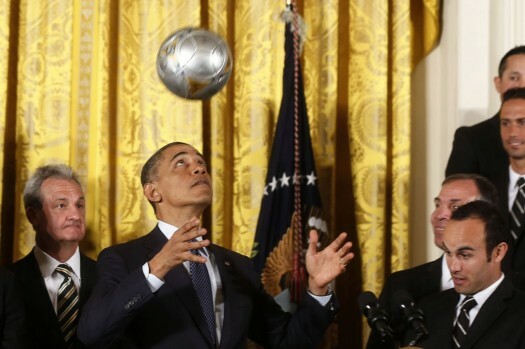 O: Why do you call it “juggling” when you’re only using one ball? Well, that’s one way to get rid of a fly. One is involved in pointless pasttimes, is kicked around, goes out of bounds, and dribbles…. the other is a ball. “I’m attempting to reach out to Romney voters by doing more dweeb athletics more often attributed to Whites”. Obama’s staunchest supporters were not impressed when they were told to report to the Ballroom for an important announcement. One is an orb filled with air, the other is a soccer ball. Upon seeing “Mr. Ben,” Obama knew that Hillary Clinton was close by, but was left wondering just when “Mr. Wa” would appear. One is an empty shiny object adored by throngs of international elitists. The other is a soccer ball. Obama doesn’t understand the rules of Dodgeball! …maybe he can’t dodge a wrench. Obama trying to use Jedi mind tricks to fool the American people into thinking he is the reincarnation of the Galactic Emperor. Obama just invented the Large Headon Collider!! No Mr President, that’s not how you prove you’re “Better than any Navy SEAL”! Obama using his head for the first time in office. An alien probe concludes that; based on observing some of the planet’s “leaders”, there is no intelligent life on earth. Obama’s biggest regret about the sequestration was the cut in the White House entertainment budget. You guys are joking that’s there’s a Sword of Damocles in there,right?…right?…C’mon guys. Tomorrow mornings headlines from the liberal media: Moses parted the seas, but Obama levitates a ball! He is our Messiah!! After the unfortunate incident with President Obama, the software of the silver death star drone was changed from “kill America’s enemies” to a specific list of America’s enemies. Obama views the scale model of the Death Star, as it hovers about his Pinocchio nose. This is classic – he can juggle one ball! Another meteor headed for Earth is deflected by the power of the presidency! Isn’t it amazing Obummer has nothing better to do than this! BHO is being paid for this BS? Balance the ball, honk the horn, then Michelle gives me a fish! That’s funny-after the last five years, I didn’t think Obama had ANY balls. The three stooges would be impressed.. Damn, I was wondering why Joe Btfsplk was jumping for joy as I was leaving Dogpatch this morning. I got it, I got it, I don’t got it.